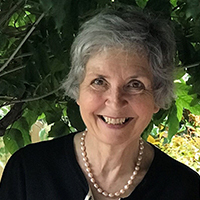 Janice Jones who completed a Bachelor of Arts at UNE in 1989, has been awarded Medal of the Order (OAM) for her service to the visual arts and community health. Mrs Jones, who has had a successful career as a teacher in Art History, as founding president of a health education charitable fund, and as an author, says her education at UNE changed her life. “UNE changed my life and goals. All thanks to the opportunity of free education at the time and the wonderful lecturers, all encouraging and giving, in the English and History Departments where I discovered new and other worlds,” said Mrs Jones. In 2002, this confidence would see Mrs Jones, with the encouragement and hands on help of her husband Robert, launch a charitable foundation which would prove to be one of her greatest achievements. The Rodmell Fund for Aged Care Nurse Education was established in memory of Mrs Jones’ Aunt, Joyce Rodmell, a former Director of Nursing at Sydney Hospital. The fund finances specialised education and scholarships in Aged Care Nursing in the Wingecarribee, Wollondilly, Upper Lachlan and Mulwaree Goulburn shires. “We raise money to fund highly specialised and practical education days in vital areas such as ‘recognising a deteriorating patient’, ‘the experience of dying’, ‘end of life pathways’, ‘communication in end of life care’, ‘wound management’, ‘dental and hearing loss’ and much more’,”said Mrs Jones. The fund has gone from strength to strength over the last 15 years and has recently launched a Donor Scheme to raise further funds. Mrs Jones says this would not have been possible without the support and ongoing effort of the hard working Rodmell Committee. While Mrs Jones said she was shy about the publicity of receiving an OAM award, she hopes it will raise awareness of the cause. “The publicity of this award, while shy of it personally, could just be the catalyst to spread the word much further afield,” said Mrs Jones. For more information on The Rodmell Fund for Aged Care Nurse Education visit rodmellfund.org.